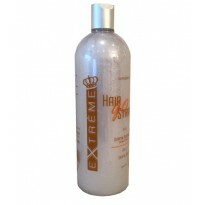 Hair Go Straight Blowtox Treatment is for individuals with wavy, frizzy and damaged hair. Our Brazilian Blend of strawberry enriched ingredients is guaranteed to make hair smooth and shiny with a long lasting straightness effect. Made in U.S.A.
Wash hair with Hair Go Straight Clarifying Shampoo for deep cleaning and repeat process. Dry hair to approximately 90%. Apply product, brush sections and apply ¼ inch from the root, do not apply on scalp. Blow-dry completely while straightening the hair using a round brush. Complete treatment using ceramic or porcelain flat iron. Instruct client to wash hair 48-72 hours after application. During this time do not put hair in ponytail or behind ears.